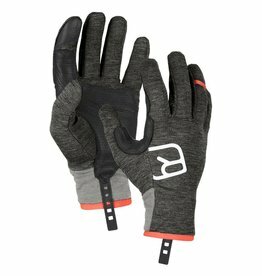 Meter after meter, you strive for the summit: the new Ortovox TOUR GLOVES for men will be your loyal companions, because they have been specially developed for long ascents and demanding ski tours. The comfortably soft merino fibers on the inside ensure excellent wear comfort, while the thin merino wool lining provides additional warmth, and the shell protects against wind and light precipitation. And these softshell gloves are very breathable and quick drying. The elastic loss protection and transport carabiner make sure your TOUR GLOVES are attached if you ever have to let go. The practical pull-on aid is particularly advantageous in freezing temperatures, when cold fingers want to get straight back into the warm. Soft, elastic MERINO FLEECE LIGHT at the wrist acts as a pulse warmer and effectively keeps the wind and cold at bay. Inserts made from goatskin leather with punchhole reinforcement on the palm always ensure a good grip and provide the necessary robustness for intensive use. The particularly elastic soft thumb area provides maximum freedom of movement and ensures that you have a good grip on everything – no matter the temperature. 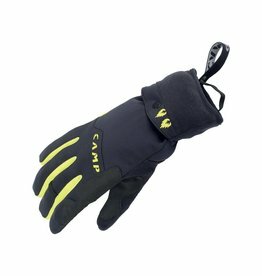 The new TOUR LIGHT GLOVES have all the prerequisites for being your most loyal companions on a ski tour, no matter how high you go.